Everyone knows the story of J.K. Rowling and her journey from poverty to Harry Potter. In the course of 10 years, she released seven novels and has since seen her ideas come to life in films, amusement parks, Broadway plays, additional novels and so much more. These tales of magic and mystery have captured audiences around the world and continue to make an impact on multiple generations. From trivia nights at bars to movie marathons in theaters, Harry Potter-themed events bring people together in a way that sparks real-life magic – and Wizardfest is no exception. 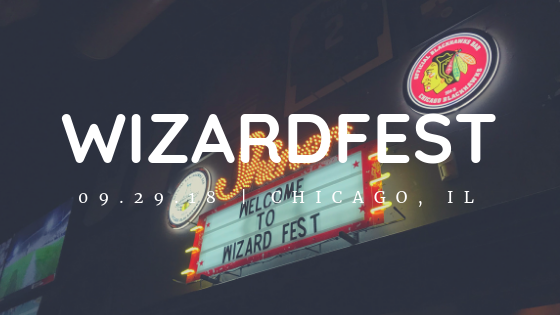 When Wizardfest made its way to Chicago on September 29, the location of Joe’s Bar was the perfect fit for a magical hideaway. Walking past the bar and through the doors into the venue was like their very own entrance into Diagon Alley, minus the tapping of certain bricks. Inside held decorations of house crests, homemade dementors and character cardboard cutouts. Three drink specials – Butterbeer, Fire Whiskey and Polyjuice Potion – were on tap alongside tables set up for Quidditch Pong tournaments. DJ Just Lance provided the sound for the evening, from dance hits to the instrumentals of the movie soundtracks. Local guitarist of the band Sleep On It, Jake Marquis, also joined the party with a guest DJ set. The standout decoration of the night gave off a Mirror of Erised vibe thanks to Charmed Moments. Their full-length mirror photo booth complete with themed props was the perfect touch to have as a keepsake from the night. Wizards and witches of all shapes and sizes arrived in their best costumes, including Hagrid, Bellatrix Lestrange, Moaning Myrtle and Madame Maxime. It truly was a remarkable sight to see the impact that these novels made on all races, genders and sexual preferences. Everyone in the room had a common interest, and that alone created a uniquely accepted environment. Wizardfest may have just started out as an idea to honor the Harry Potter world and all who love it, but seeing the event come to fruition was an entirely different feeling. The impact of seven novels is almost beyond understanding, but is the reason behind many magical moments.